Six days after the attack on the Belal Mosque in Rawda village, none of the armed militant groups operating in Sinai have claimed responsibility for the carnage. In fact, every group known to operate in the region but one has condemned the deadliest militant attack in Egypt’s history that left 305 dead and 128 injured. The Islamic State’s Egypt affiliate, Province of Sinai, is the one exception. The group’s resounding silence, however, has not shielded it from accusations of having carried out the attack. But the silence on the group’s known channels has given way to a flurry of communication on Islamic State forums that points toward disarray among the group’s supporters. Some have defended the attack with pride, while others have argued that the accusations amount to an attempt to smear the group, a seeming admission of disbelief. The division spelled out in IS-affiliated forums suggests that the Rawda attack marks a turning point for the group in more ways than one, if it was really carried out by its fighters. For analysts interviewed by Mada Masr, the attack may point to a broader strategy of violent, targeted attacks by the Islamic State, that could be connected to its territorial losses in the region and its historical origins in post-US invasion Iraq. The magnitude of the attack in Rawda left everyone in disarray, including supporters of alleged Islamic State-affiliated groups, and especially the Province of Sinai. On the Shumukh al-Islam Forum, a website and forum where hundreds of Islamic State supporters in the region are registered, discussions initially centered on the details of the attack, but forum members gradually shifted toward condemnation through citations of Quranic verses, hadiths and Jihadi Salafi literature. In some of the exchanges, members accused those critical of the attack of exaggerating its extent and, in some cases, of maintaining allegiances to other Islamist groups. The forum administrators eventually closed the thread and restricted members’ access to its pages. 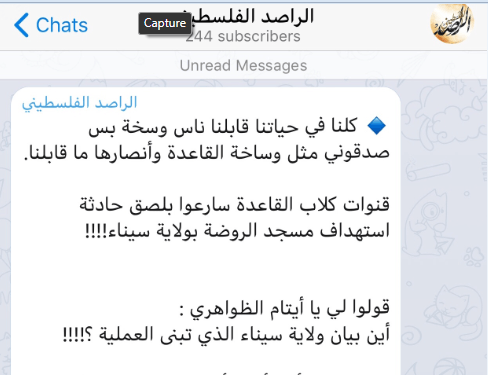 Telegram broadcasting channels allegedly affiliated with the Islamic State exhibited a general tendency to condemn the operation and claim that it was carried out by state agencies. These channels also condemned rival militant groups, with Al-Qaeda receiving plenty of accusations. “Channels of Al-Qaeda dogs hastened to wrongfully accuse the Province of Sinai of being responsible for the Rawda mosque incident. Show me, you Zawahiri orphans, a statement where the Province of Sinai claims the attack,” writes one Islamic State supporter, on the Rased al-Philistine channel, which often shares Province of Sinai news. Other group’s supporters adopted a different tone on social media, however, attributing the attack to the Province of Sinai in boastful terms. Ahmed Mawlana, an independent researcher on Islamic movements, tells Mada Masr that concerns about the consequences of the attack may be behind the delay in Province of Sinai claiming responsibility for the violence in Rawda. It took the Islamic State affiliate three days to assert it had carried out the downing of a Russian passenger jet over Sinai in 2015, which is the longest the group has waited before claiming responsibility for an attack to date. 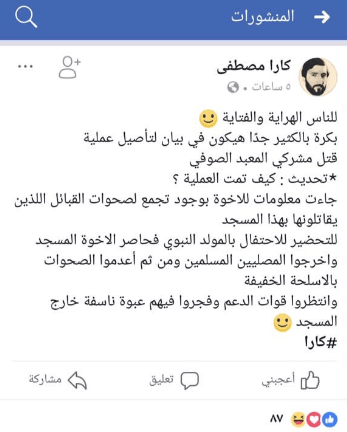 Mawlana recalls how groups allegedly affiliated with the Province of Sinai issued a statement following Sisi’s election that amounted to the excommunication of [Salafi Jihadi lawyer] Hazem Salah Abu Ismail for what they perceived as his support of democracy. The decision had an adverse effect, as it drove away many Abu Ismail fans who had admired the group. Beheiry also poses that the attack may have nothing to do with anti-Sufi sentiment. Rather, he argues that the deadly attack was likely a message to the Sawarka tribe, one of the main tribes in Sinai some of whose leaders have been collaborating with the Armed Forces in its conflict with the militant insurgency in the region. For Beheiry, the Rawda attack reflects ramifications that extend beyond the immediate territory of the Province of Sinai. “The attack is most likely to have been ordered by a regional actor outside Egypt, which shows that the Islamic State has adopted an old model, one that was employed by the Iraqi branch of Al-Qaeda,” Beheiry says. Beheiry’s comparison points to Al-Qaeda in Mesopotamia, the Iraqi branch of Al-Qaeda, which later evolved into a seed that sprouted Islamic State groups in the region who carried out similar attacks. Just a few months into the United States invasion of Iraq, Al-Qaeda began to take up operations in areas with large Sunni populations. Although its parent group, led by Osama bin Laden at the time, only targeted Western governments and nationals, the Iraqi branch did things differently. Some of its most notable strikes include the 2004 Ashura bombings, in which 271 Shias died; the August 2007 Qahtaniyah bombings, which left 796 Yazidis dead and 1,562 injured; the 2006 Dujail attack, where at least 70 Shia individuals were killed at a wedding and thrown into the Tigris; the Our Lady of Deliverance church attack, in which 58 Christians were killed; several synchronized bombings that targeted Baghdad in 2009 whose motive was never clarified but killed more than 90 civilians; and the killing of 140 people in 2012, 114 people in July 2012 and 84 people in June 2012. As the targeting of religious minorities in Iraq – especially Shia Muslims – escalated, the first signs of discord between the Iraqi branch and the Al-Qaeda parent group began to manifest. On one side was Abu Musab al-Zarqawi, the first leader of Al-Qaeda in Iraq, and Abu Bakr al-Baghdadi, who would come to head the Islamic State. The other side was and has always been represented by Ayman al-Zawahiri, who would come to head Al-Qaeda. The discord started with a letter Zawahiri sent to Zarqawi in 2005, in which he explained that antagonizing Shias would ease the burden on the US occupation and pointed out that common Shias should not receive the same treatment as Shia political leaders. “Why antagonize common Shias, if their ignorance is their excuse? We must target them with daawah [preaching], explanation and tabligh [communication of Islamic message] to lead them to the rightful path,” Zawahiri wrote. Later in the letter, Zawahiri directed a more strongly worded criticism toward the filming and broadcasting of slaughter. “The media arena is where more than half the battle is set. When it comes to media, we are battling for the hearts and minds of our nation,” he wrote. However, the responses from Iraq were never what Zawahiri wanted. “No civilian is safe as long as they are infidels,” Zarqawi reportedly said in an October 2005 audio recording sent in response to Zawahiri’s letter. Several years later, Zarqawi and Bin Laden had died. Zawahiri had ascended to the top position in Al-Qaeda, and Abu Bakr al-Baghdadi took over the regional Iraqi branch. The disagreement on tactics grew into a difference in doctrines and strategies. Baghdadi believed that the time was right for the immediate declaration of a caliphate, accusing Zawahiri of unnecessarily delaying such a measure. Baghdadi refused to pledge allegiance to the new Al-Qaeda leader after Bin Laden was killed by US forces. Zawahiri, on the other hand, believed that the declaration of a caliphate would make “the nation” prey to Western states and Arab governments and thereby render Jihadi groups easy targets. Although Beheiry’s argument that the assault on the mosque was intended as a message to Sinai’s tribes seems to contradict the group’s longheld pursuit of supporters from sympathetic communities, an examination of the larger context presents a somewhat clearer picture. “This is one of several messages that we have to piece together in order to see the larger picture,” Behiery says. The attack on Rawda, according to Beheiry, marks the beginning of a new era. The battle is no longer being fought according to the fundamentals of consolidating territory that were laid out by the Islamic State when it first began operations in Iraq. Rather, he argues that Rawda represents a return to Al-Qaeda’s tactics in the immediate aftermath of the US invasion, where everything was a potential target and the sole purpose of an attack was to instill terror.